Major hotspots of Camel Safari in India include Jaisalmer, Jodhpur and Bikaner in Rajasthan. All of these were the princely kingdoms in the wide stretches of deserts. Each one of them is easily comparable in size with many European countries. These erstwhile capitals prospered from trade as the camel caravans traveled from West Asia and Europe to Mongolia. These were extensively fortified to protect their wealth. Resultantly a number of spectacular palaces, havelis or courtyard mansions were built for merchants and nobility and intricately carved temples for the subjects. The materials used here was normally sandstone, as it was easily available. It provided a better medium to the Silavats who specialized in making stone resemble lace. Camel Safaris are regarded as the most suitable way to explore the desert as you can visit the villages, pass through the wildlife and ride across the open desert sands. Specific camel safaris are organized around Jaisalmer. The architectural ruins of Lodurva are located very near to it which was the former capital of Bhatti Rajputs before the foundation of Jaisalmer. Other highlights here include Anna Sagar oasis, sand dunes of Sam and water source of Mool Sagar, where village women gather with pitchers at dusk. The trip also includes night halts at villages on the way or temporary bivouac camps amid desert scrub. Here follows a brief description of major camel safari regions in India. Thar Desert of Rajasthan is the premier destination of Camel Safari in India. These are organized with utmost skill and imagination. The duration of safari may range from 4 to 15 days, but minimum time duration usually fluctuates around the duration of a week. Thar Desert is almost a world of its own, resembling an unending ocean of sand. Its own wildlife is dotted with dunes and patchily covered with xerophylic shrubs. While you are on a camel caravan, you encounter the warmth of hospitable villagers and ruins of historic forts and palaces of Rajasthan. Jodhpur, Jaisalmer and Bikaner are the best locations for camel safari. Bikaner-Jaisalmer safari takes around 11 days, covering 25 to 30 km a day. Its route is known to none but the camel riders. One more option in the desert heartland would be Shekhawati region, which takes such towns as Ramgarh, Nawalgarh, Churu, Dundlod and Mandawa. Precisely, one or two-day camel safari trips can also be organized and safari routes may incorporate interesting variations as Jaisalmer to Rann of Kutch in Gujarat. 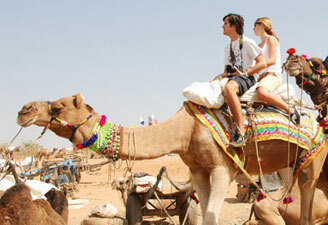 Special camel safaris are also organized around Pushkar and Nagaur during the winter season, between October to March. Popular cattle fairs are held in these two cities. Another popular destination for Camel Safari coming up in the safari circuit is Chambal Safari. This is another attraction which offers a fine instance of eco-friendly tourism in rural India. You get a rare chance to witness the rich cultural heritage and wildlife legacy placed against arid backdrop. Chambal Safari is a worthy excursion for all the visitors to Agra. The tour package comprises of two key activities, a river cruise along with a camel safari. The river cruise is conducted by Pathanias, which takes you along Chambal river for 30 km and provides close encounters with Ghariyals and Crocodiles. The camel safari takes you to the majestic Atar Fort.